The future of former Chelsea forward Didier Drogba continues to lurch from one crisis to another with the Ivorian's club admitting that he and Nicolas Anelka could still be forced out over a boardroom battle. 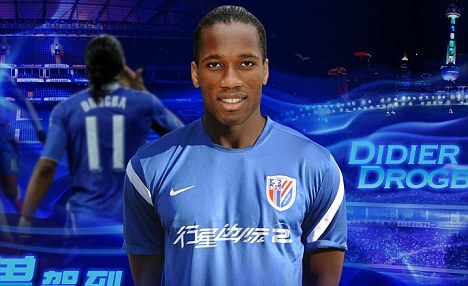 Drogba only moved to Shanghai Shenhua in the summer but his time has been blighted by a financial row among shareholders. Whowin having been his backing by manager Sergio Batista who insisted things had been resolved. However, the billionaire businessman behind the vast investment refuted the claims of a deal and local media reported the tycoon had threatened to withhold the salaries of foreign players. It is claimed that following his initial purchase and investment for 28.5 per cent stake in the club, Zhu was due a rise to 70 per cent based on continued funds being able. Shanghai Youth Daily newspaper carried a quote on from an unnamed source, saying: 'If this issue is not resolved satisfactorily, from October Zhu Jun might take action. 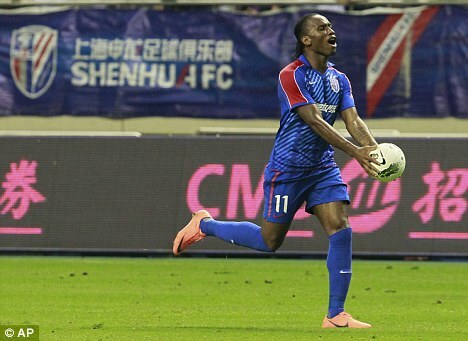 Shenhua are ninth in Chinese Super League.